Come gather ’round the fire at Trail of Tears State Forest on Monday April 18th at 7 pm for Shawnee Chapter Illinois Audubon Society’s annual Under the Stars program. 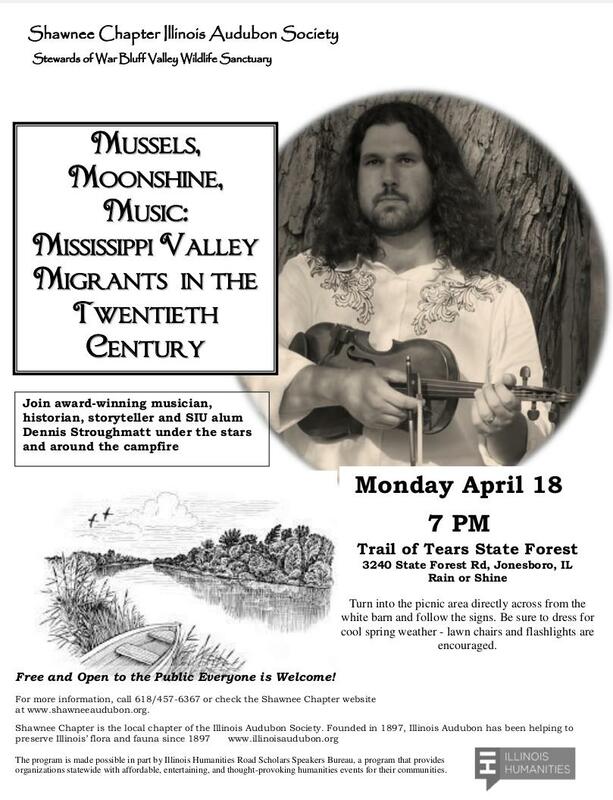 This year we are lucky to have Dennis Stroughmatt and his program on Mussels, Moonshine, Music: Mississippi Migrants in the Twentieth Century. Nationally recognized musician, cultural historian, storyteller and SIUC alum Dennis Stroughmatt will lead a voyage of discovery incorporating artifacts, folktales, and performances in river-based musical styles passed down from his mussel-shelling and river-working grandfather Chancy Stroughmatt’s generation. Dennis will invite audiences to visit the history of early-20th-century Illinois and even sing along to the music of the age. In a time almost forgotten, the Midwest and upper South were home to thousands of Americans who lived and worked along or on the rivers as sharecroppers, fishermen, mussel shellers, button cutters, traveling minstrels, and even moonshiners. Work was their lives, and the work was hard. Although they were the backbone of industry in cities like Muscatine, Iowa, and Cairo, Illinois, they played too, enjoying the music of Memphis and St. Louis along their way. This free public program will take place at the Trail of Tears State Forest located at 3240 State Forest Rd, Jonesboro. The State Forest is east of State Rte. 127, just north of Jonesboro. Turn into the picnic area directly across from the white barn and follow the signs. Be sure to dress for cool spring weather. Rustic seating will be provided but lawn chairs and flashlights are encouraged. If it rains, we’ll be under the historic picnic shelter with fireplaces a’ blazing. Shawnee Chapter is the local chapter of the Illinois Audubon Society. 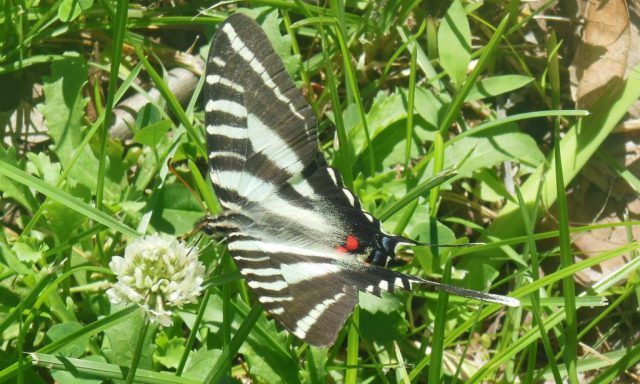 Illinois Audubon has been helping to preserve Illinois’ flora and fauna since 1897. More information is available at www.illinoisaudubon.org. The program is made possible in part by Illinois Humanities Road Scholars Speakers Bureau, a program that provides organizations statewide with affordable, entertaining, and thought-provoking humanities events for their communities. Feel free to contact me at: 618/457-6367, by email, featherfoil1@yahoo.com or check the Shawnee Chapter website at www.shawneeaudubon.org. Monday April 18 @ 7 PM at the Trail of Tears State Forest. Shawnee Chapter, Illinois Audubon Society’s Annual “Under the Stars at Trail of Tears State Forest ” program. Musician and cultural historian Dennis Stroughmatt will lead a voyage of discovery incorporating artifacts, folktales, and performances in river-based musical styles passed down from his mussel-shelling and river-working grandfather Chancy Stroughmatt’s generation. He will invite audiences to visit the history of early-20th-century Illinois and even sing along to the music of the age.